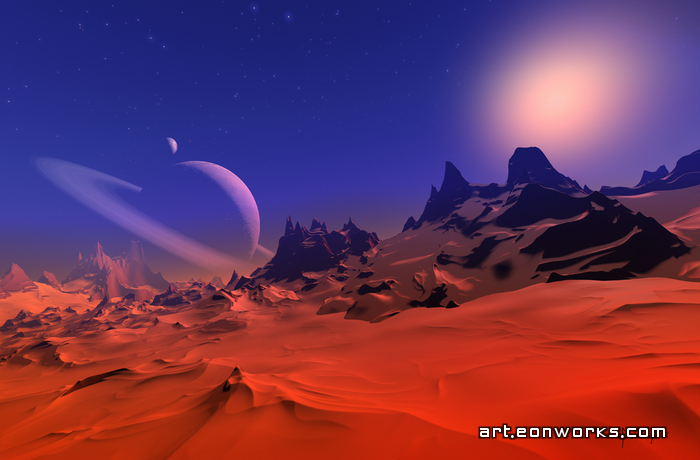 A space scene of an early afternoon on a faraway red planet. The surface of the mountains is covered by snow with a thin layer of red iron oxide, or simply dusty rust. The red-orange surface and the bluish sky creates an almost illusive ambient illumination. Near the horizon a giant ringed planet and its moon are slowly emerging. I think this is my favourite pic. Love the color contrast of blue sky and red sand. Thanks Victor. And I agree, it also would be nice to go on vacation to such a place! once again dawid, Well done! have you heard of anyone starting to make images like this thats been inspired by you. I'm doing a year ten photography class assignment on you if thats all right and I need some info. It would be really helpful if you could send me some info on your work. WOW this is great. I love the colors!